Discussion in 'Outdoor Cooking and BBQs' started by CraigC, Dec 1, 2017. We purchase a 12# fresh turkey which I wet brined last Tuesday. Removed it from the brine late Wednesday night to let it dry some in the fridge. At 5:00 AM, EST Thursday, I removed it to warm up. I set up my BGE for indirect cooking, mixed some 1/2 splits of pecan in with the lump charcoal, then added a full chimney of lit coals on top. Let the Egg come to temp at 250F. I put the bird on at 8:00 AM, over a drip pan set on the Egg's plate-setter. 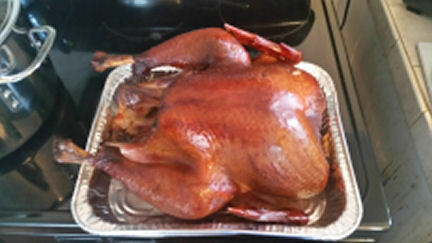 The bird was done around noon. This is the first time I've done a bird on the Egg and it came out with a much lighter mahogany color than the birds done on the Horizon, off-set. I used the pan drippings, along with a turkey stock I made the previous Sunday. I referred to the de-fatted, cold stock as "Turkey Jello". detroitdad, Shermie, Foodiesforacause and 1 other person like this. That looks fantastic. Brining is something I've just become interested in and in fact today I'm cooking a pheasant which I brined yesterday. I'm assuming the Egg is a type of barbecue? 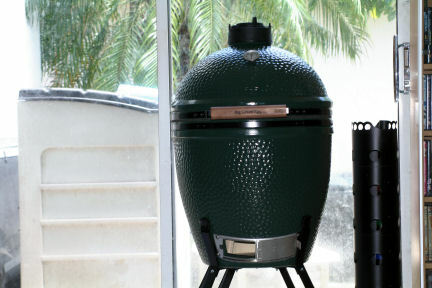 Yes the Egg, known as Big Green Egg, is a ceramic Komodo style cooker. It can cook at a steady temperature for low and slow BBQ or be cranked up to 900F (some folks take them to 1000F) for pizza or searing. I've been wet brining fowl for many years. Now there is a trend to dry brining. ElizabethB, Elawin and morning glory like this. I had to go digging to find a picture of our BGE. This is a large. Its not green! Maybe its the light or perhaps its very dark green. I would love to have something like that but I don't think I can justify the expense. The weather here would render it unused for much of the year. Francesca, Shermie and ElizabethB like this. It is dark green. We only have two seasons in SE Florida, Summer and Tourist. We are still waiting for Tourist to begin. I know folks that use their Eggs in winter up north. Once you get the Egg up to temp, that thick ceramic will maintain the internal temp for hours and I have done several cooks on one load of fuel. The weather here would render it unused for much of the year. We had a BBQ two weekends ago, and we're planning having another one soon - can't let the weather stop you The only awkward thing about trying to bbq in the winter is finding a place that to buy the charcoal! Yep....£599 for the tiny baby one, but that one is far too small to be practical. You're looking at £1k+ if you want a decent sized cooking area and you want to be able to move it around. Back when I bought my large, I paid cash and negotiated for the Egg and wheeled stand (Nest) for $900.00. This isn't just a grill/smoker. You can take it to 900F for pizza and bake bread in it. You haven't had great steak, at home, until you do a 3" thick ribeye using a reverse sear method. Karen won't let me do steak on the grill anymore unless it is done using this method. I paid $1000.00 for my Horizon smoker. I got tired of buying, home improvement store offsets, which get bolted together. They are made of such thin steel, they eventually fall apart. I bought and replaced 3 of those, which the total cost was more than what I paid for the Horizon. Someone will inherit it and my BGE. The Horizon is made of 1/4" steel, is welded together and weighs 500 lbs. If I had been smart enough to buy it in the first place, I would still have the $1500.00 or so I spent on the others and be ahead $500.00 or so. This isn't just a grill/smoker. You can take it to 900F for pizza and bake bread in it. You haven't had great steak, at home, until you do a 3" thick ribeye using a reverse sear method. Karen won't let me do steak on the grill anymore unless it is done using this method. You are beginning to persuade me! I'd love a proper pizza oven. We all know a domestic oven can't match the temperatures needed for pizza. Back when I bought my large, I paid cash and negotiated for the Egg and wheeled stand (Nest) for $900.00. That's a much more reasonable price (about £670 even at today's terrible exchange rate). As usual things are much more expensive over here A similar setup here would cost around £1200 (approx $1620). If you want a pizza oven how about the Uuni 3 Wood Fired Pizza Oven? They seem to get rave reviews. That is very interesting! Thank you. I am glad G does not visit this forum - if he did he would buy a BGE. We have too many, underused cooking thingies.